Add auxiliary audio input to most new GM radios Upgrade your car with today’s latest technology and best possible sound quality with this premium integration solution. Enjoy your favorite songs, discover new content with internet radio, and safely manage phone calls, hands-free with a touch of a button. One discrete module hidden in your vehicle seamlessly connects your devices while providing control through your factory radio and steering wheel controls. The adapter's USB port provides charging and music playback from your smartphone or music playback from a portable USB hard drive or thumb drive. Connect, your phone, your car - wirelessly. Bluetooth device MUST support hands free profile (HFP) in order to be compatible with the Connect. 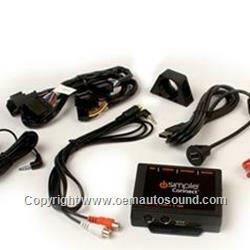 Aftermarket Satellite Radio support requires the purchase of the ISSR11 & an SCC1 tuner (both sold separately. Radio must be equipped with a "CAT" + "Band" button combination or "XM" button to be compatible. Not compatible in Cadillac SRX equipped with rear seat entertainment.